We manufacture an extensive range of products that are safe by design, meaning that they do not use operating cords or chains or have concealed or tensioned cords. We strongly recommend that these products are always considered first when you are buying new blinds for homes or public buildings. 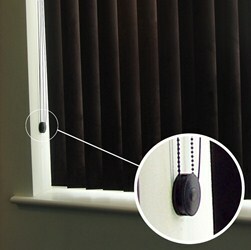 If you're buying new blinds from us, we will always suggest cordless blinds*. Hannan Blinds also provide a range of safety devices, which have been tested to the new mandatory standards and can help to make existing blinds safer. There are options for every style of blind so you do not have to wait until you change your blind to make it safer. Please contact us to make your blinds child safe. If you would like to get a Child Safe Blind device, call us today on 01772 719 834, visit our showrrom or email us through the website.